Omar Dimas I have tested this code and is working as described, place it at the checkout and get 25% Off Sale Section at Undercover Mama. Erika Vogelsang I am validating that this deal works as described. Just enter this code during the checkout process to apply this discount. 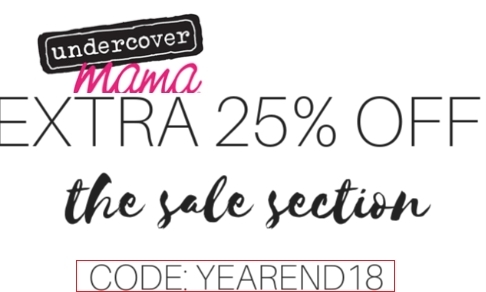 Reina Castrillo This deal works as described, enter the promotion code YEAREND18 during checkout to receive 25% Off Sale Section at Undercover Mama.